Written by Hinowa Kozuki as a light novel before becoming a manga, with art by Waka Miyama, Elegant Yokai Apartment Life (EYAL) is a slice-of-life manga with paranormal encounters. I was skeptical at first about whether or not I would enjoy this series. I tried watching the anime when it first aired on Crunchyroll over the summer of 2017, but the first episode failed to capture my attention. Since I was in an anime slump at the time, I’m not surprised. Considering that none of the 2017 summer anime interested me, even though I had been hyped for many of them, made me feel like I needed to go back and give this one another try. Besides, I love yokai stories, with series such as Noragami, Natsume’s Book of Friends, and xxxHolic all at the top of my list. Stories with a slight touch of the supernatural are always big winners in my book, but instead of trying to rewatch the anime, I thought I would start with its source material, the manga. If you’ve watched the anime, volume one of EYAL is very similar to the first episode. We are introduced to our main character, a young man by the name of Inaba, who has just graduated from middle school and will be transferring to a new high school. His goal for so long has been to transfer to a school that has a dorm so that he would no longer feel as if he were a burden on his aunt and uncle. When tragedy strikes (his dorm burns to the ground), he has to get creative on where he will move to next. It seems luck is with him, as he finds a nice, affordable, Japanese-style room for only 25,000 Yen ($250) a month, with a communal hot springs style bath and food thrown in for free. If only the states had prices like that! However, there is one catch to this wonderful apartment he has found: the apartment is home to many Yokai, or ghosts, who also board there. But Inaba isn’t bothered by a few yokai and grabs his chance at an affordable apartment, and honestly, who can blame him? I wouldn’t mind living in a haunted apartment if it was this nice. 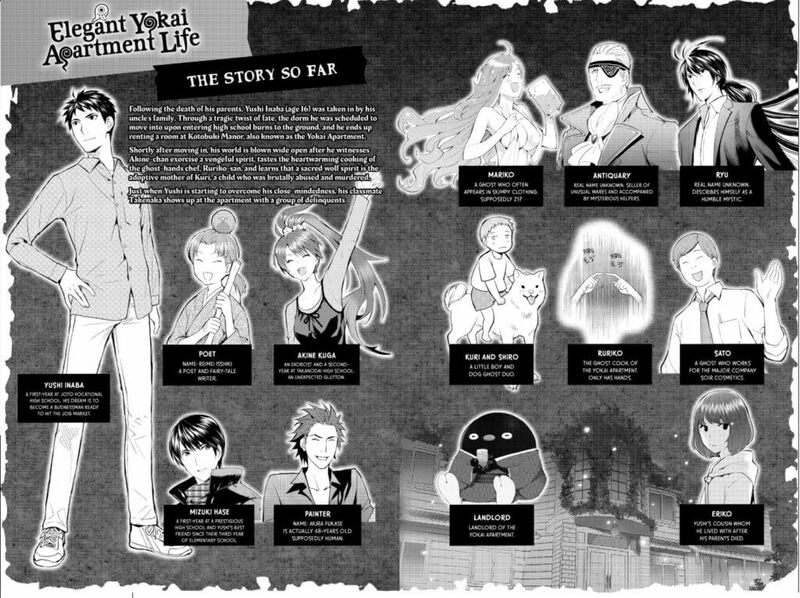 So Inaba’s Elegant Yokai Apartment Life begins, and as the chapter goes on we are introduced to more of the supporting cast. Mizuki Hase is Inaba’s best friend from middle school who seems to have troubles of his own, but he has a good heart for the people he cares about. Reimei Isshiki is an author who also boards at the apartment, and who I’m still not sure is human or yokai. From what the anime and manga have to say, he is apparently a human, but I still have my doubts about that. He just seems too “other-wordly,” and if you decide to pick up this series, you will understand what I mean. Lastly, Akine Kuga is a young high school girl, an exorcist, and a big eater. I really like Akine’s character, and as the story progressed I liked her even more. She hasn’t been set up as a love interest, but as a friend and fellow boarder in the series, which is refreshing in its own way. Akine is a strong female character that is able to stand up for herself, and even later on trains Inaba to build up his spiritual powers. Her character is bubbly and happy, but she’s not an airhead. Besides the very human residents, there are also the yokai that inhabit the apartment building. Kuri and Shiro are a young boy and a white dog that lost their lives far too early in a tragic way. There is also Ruriko, a pair of floating hands that handles all of the cooking. Out of all of the characters, Ruriko might be my favorite. Her backstory is extremely sad, so I won’t spoil it by telling you what it is. Just know the fact that Ruriko stays behind as a ghost, with only her hands being the visible part of her, and is still happy with how things are now is heartwarming. Overall, the storyline for EYAL is a simple slice-of-life manga with a touch of the paranormal, and it’s that touch that gives it such flavor. EYAL is a fun read and a fun watch. Inaba isn’t the typical air-headed protagonist; he thinks his way through things and accepts them as they are. He also has a tendency to act much more mature than his age, a habit he had to develop after losing his parents at a young age. 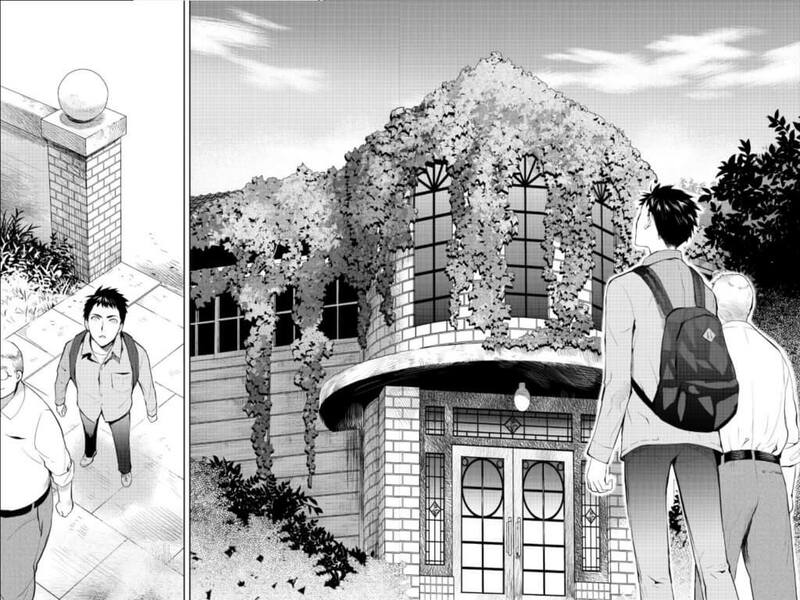 EYAL has the feel of a seinen manga rather than a typical high school slice-of-life/coming of age story since Inaba’s character has to deal with some rather adult issues, such as paying rent on time and finding a place to stay on his own without familial support. His interactions with the fellow boarders of the yokai apartment speak to his experience in life and his willingness to change. The art style for EYAL is simple and elegant, but it works well with the story and the theme of the chapters. The sense of restlessness in Inaba comes through well in the beginning, along with his urgency to find a new place to live. The backgrounds shift from being fully detailed to minimal, and when something uplifting happens, they become lighter and airier in a way. I enjoy the art style of Elegant Yokai Apartment Life overall because it doesn’t try too hard to be one thing. It seamlessly works at being multiple things at once: a comedy, a slice-of-life, and a ghost story. The artist, Waka Miyama, is very skilled, and his expressions for all of the characters are on point. Even Ruriko, who is only a pair of floating hands, is full of expression and poise throughout the series. I think my favorite part of all of the detail is when Inaba is introduced to the apartment building for the first time. It is an older European style house covered in vines. It’s beautiful, almost breathtaking, and seems to exude an elegant essence right off of the page, as if when you enter, you might be transported to a simple English tea-party, and not a boarding house filled with different, sometimes very strange, yokai. Volume 1, Inaba’s first time seeing the Yokai Apartment. My one issue with the series is that Kodansha has licensed it for the US as an e-book only. This would normally be fine, except that for every page I read, I typically have to zoom in so the images and words won’t be distorted, which takes away from the overall experience. I find myself skipping pages because it’s such a hassle, and if I wasn’t already invested in finding out more about the other characters, I would have put down the series a long time ago simply for the effort I have to put into reading it. Although, that might say more about comiXology’s platform than anything else, since I have tried reading the series on other devices besides my laptop, and don’t seem to have that problem as often on my phone or my tablet. As a series, I recommend Elegant Yokai Apartment Life to anyone who is in need of a slice-of-life story that has a little extra push to it. Inaba is a character that anyone on the threshold of change can relate to. With eccentric characters and a simple plot, it is a story that anyone can enjoy no matter where they are in life. Special thanks to Kodansha Comics for providing us a review copy of the first volume of Elegant Yokai Apartment Life! If you would like to purchase the manga, please visit Kodansha’s website. If you’d like to find out more about the series, you can check it out on Anime Planet, or watch the anime on Crunchyroll.